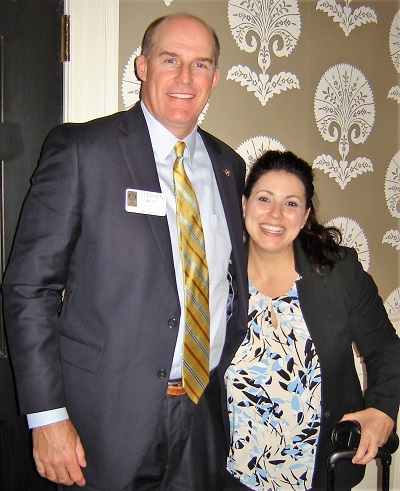 Capital Rotary members got a “bulls and bears” look at the economy and stock/bond market when Nicole Dill (in photo with Rotarian Stephen West) was the club’s guest speaker Nov. 14. Dill, a Chapin resident, works with JP Morgan Asset Management and has 20 years of experience in financial services. In her briefing she said (1) the US economy has not had problem inflation for 30 years, a trend that will continue; (2) another recession is expected in the future, likely 2021or 2022; (3) 1,300 “baby boomers” will be retiring each day for the next decade, helping to fuel labor force needs that could keep the nation at or near full employment; (4) the Federal Reserve Board is predicted to raise interest rates in December 2018 and March 2019, and perhaps in June 2019, but probably not in September 2019; (5) the US has a consumer-driver economy, with 70% of our growth due to consumption: people buying things; (6) recent mid-term elections helped restore a more balanced government divide between Democrats and Republicans, which has been the nation’s norm 61% of the time; and (7) investors need to rebalance their accounts yearly because of national and international economic change.